if the recipe actually did in fact prove to be the “Best”, or even close to it. list. This is that recipe. was in all caps), but win me over it did. experiment, I should go with the first recipe that popped up. Alice’s photo on how fluffy should look. – Add eggs and vanilla and beat for an additional 2 minutes. – Finally add the chocolate chips until well distributed. or ziplock bag and store in the fridge for 24 hours (up to 36). the cookies to cool on the paper for at least 3 minutes before serving. to your life is a suspension of cynicism. cookies or brownies or anything else. They look fntastic! Perfect looking. Guh. Madly want some now. I almost want to lick the screen. Keep me away from the computer durn it. Hi Gio! Hehe 🙂 I am so happy to have stumbled on this recipe! Did you add the walnuts as well? Although some of the proportions are a little different, the recipe is VERY similar to David Lebovitz' salted butter chocolate chip cookie recipe. And those were delicious. Like you, I'm half reluctant/half eager to try recipes touted as the "best ever"/"ultimate"/"amazing" or any other similar superlative. Part of me doesn't want to be disappointed (as in, "what, this is it?!?!") but part of me wonders what if it WAS the best, and I ignored it? Haha. Hmm, I think I'll let the cookie dough rest from now on. Thanks for the tip. Hi Dexie! I really believe it makes a difference! Hi Katrina! Wow! Thanks for the compliment!! 🙂 🙂 The cookies are really a chock full of chips — in the original recipe Alice mentions that you really need the full amount of chips (it's more than a bag)…I certainly won't argue with more chocolate! 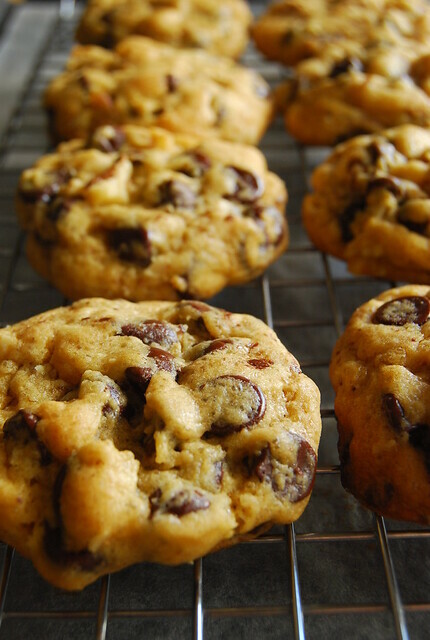 I am planning to do these with chocolate chunks next…the best I can find! Let me know how your sis' experiments go! Amazing cookies, Joey! I'm sure they must have also tasted fantastic. YUM! My fav. Thanks for the recipe. Second David Liebowitz. He has amazing recipes. Try his butterscotch pudding. Delicious! I'm so glad you liked the Brownies…. and I'm so glad you tracked down these cookies for me. Oh, wait… You didn't do it for me? never mind, thank you anyway. I'm making them!!! Hi Midge! We loved them! Hi Neo! Thanks for the tip on the butterscotch pudding! Hi Katiez! I did it for all of you! Heehee 🙂 Thank for the brownie recipe link…it was fantastic! Glad you liked them Claire! I am stuck in the NYTs recipe. I've never had so many compliments on a cookie. I really think it's the rest that helps these cookies "Bloom!" I won a baking contest with this recipe. I left out the nuts…. but omg amazing!!! Amazing Is ALL I CAN SAY!!!!!!!!! the temp to bake them is it 360 or 350 degrees? no t sure if that was a typo.